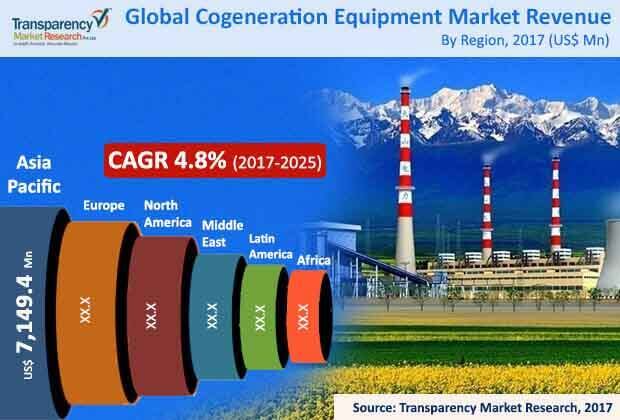 The global cogeneration equipment market is largely consolidated in nature, observes Transparency Market Research (TMR) in a new report. To further bolster their foothold, leading players in this market are forging alliances with original equipment manufacturers (OEMs) of various end-use industries. These companies are also investing in research to introduce innovative products, which will help them gain competitive advantage. They are also vying to tap growth opportunities in emerging economies, especially in Asia Pacific, which in turn will expand their geographical presence. Key players in the global cogeneration equipment market include BDR Thermea, Siemens AG, Mitsubishi Heavy Industries Ltd., Clarke Energy, Innovate Steam Technologies, Foster Wheeler AG, ANDRITZ Energy & Environment GmbH, 2G Energy, ABB, Aegis Energy Services Inc., Rolls Royce Plc., Innovate Steam Technologies, and Kawasaki Heavy Industries. The global cogeneration equipment market was valued at US$22,175 mn in 2016. Expanding at a CAGR of 4.8% during the forecast period from 2017 to 2025, the market is estimated to become worth US$33,543 mn by the end of 2025. On the basis of technology, gas turbine segment constituted more than 22.5% market share in 2016. Application-wise, the industrial segment held more than 58% revenue share in the overall market in 2016. In terms of geography, Asia Pacific emerged as the most lucrative market holding more than 42% market share in 2016. Globally, ever-increasing energy needs along with depletion of fossil fuels is necessitating the adoption of alternate techniques for energy generation such as cogeneration. Government initiatives for energy conservation and the need to tackle climatic changes have led to the adoption of cogeneration, which in turn is benefitting the cogeneration equipment market. Some of the cogeneration equipment are reciprocating engines, steam turbines, electric generators, boilers, heat recovery steam, and gas turbines. Cogeneration or combined heat and power involves generation of heat and electricity simultaneously from a single fuel source such as biomass, natural gas, waste heat, wood, coal, or oil. Cogeneration is used across a host of areas such as shopping complexes, residential buildings, oil and gas production facilities, hospitals, universities, and small and large industries. Apart from this, increasing fuel prices and unpredictable economic conditions across the world have created the pressing need for efficient power generation techniques to create sustainable and profitable energy solutions. Cogeneration is rapidly gaining popularity as it allows thermodynamically efficient use of oil at minimal energy wastage. The increasing number of renewable energy projects in several parts of the world due to depletion of fossil fuels and the abundant availability of natural gas in several parts of the world such as Russia, the U.S., and Canada are stoking growth of cogeneration equipment market. Despite a number of favorable factors, the growth of cogeneration equipment market is hampered due to several factors. High initial investment along with need for sophisticated technological requirements for deployment of cogeneration equipment is challenging their adoption across small and medium-sized enterprises. Further, lack of adequate infrastructure leading to inconsistent orders is making difficult for product manufacturers to deal with plant management, cost depreciation, and inventory costs.